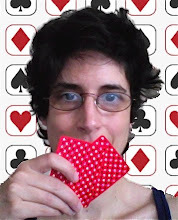 Raise or Fold: Learning (From) Poker: Do You Feel Lucky? Well, do you? Do You Feel Lucky? Well, do you? I ran across this article about people who describe themselves as "lucky" or "unlucky," and a researcher who says he's identified traits and behaviors that are consistently associated with each category. Hmm. Sounds very much like most mindfulness practices. I think the applicability to one's poker game is pretty clear. I agree, I see the same principles applying to people's poker games. You'll hear someone complain about how bad their session is going, but you'll watch them do things like raise AK and then check it down to the river after missing, only to lose to pocket threes that would have folded on the flop. They feel so unlucky that they convince themselves they have to flop the nuts to win. Meanwhile a player 'running hot' will c-bet and steal with confidence, taking down pots they would not have otherwise won. I try to be aware of when I'm playing that way, not noticing the extra opportunities that are out there, and end those sessions early if I can’t adjust. Have you completely ruled out moving to Vegas and "trying out" a true pro life-style? Not much has been said on your blog lately about what goes on with you at the moment ( not that you have to write about anything personal you rather keep to yourself and your close friends ). It'd be cool/interesting to get a post/update about how you feel about that at this stage. I really hope my question does not bother you. Why Do People Write Poker Strategy Books?